The death toll from more than five days of post-election violence in Kenya rose above 300, rights groups said Wednesday as slums burned and thousands were left homeless. The violence was sparked by charges President Mwai Kibaki stole his way to re-election - even his elections chief was quoted Wednesday as saying he could not be sure who won. The political rift quickly took on a tribal element in what has been one of Africa's most stable democracies. "Kenya has been thrown into chaos. There is little evidence here of any government at all. All across the country there is fear and distress, CBS News reporter Katherine Arms reports from Nairobi. "What has taken more than 40 years to build in independence has been wiped out in days," Arms reports. In one of the worst attacks, a mob set fire to a church Tuesday in a town about 185 miles northwest of Nairobi where people from Kibaki's Kikuyu tribe had taken refuge. There were conflicting accounts about how many people died. The Kenya Red Cross said in a statement it retrieved 17 bodies from the smoldering church, but other witnesses put the toll at up to 50. The Red Cross said houses and "large parcels of land and crops have been burnt" in the area, and major roads were barricaded, making it difficult to deliver aid. Some displaced in Eldoret have not received food for three days, it said. Government spokesman Alfred Mutua said: "Kenya is not burning and not at the throes of any division," adding clashes had only affected about 3 percent of the country's 34 million people. But the intensity of the violence was sobering, and Kenya's political leaders continued to wrangle. The independent Kenya Human Rights Commission and the International Federation for Human Rights said in a joint statement more than 300 people had been killed since the Dec. 27 vote. The U.N. cited Kenyan police as saying 70,000 people had been displaced in five days of violence. Around 5,400 people have also fled to neighboring Uganda, said Musa Ecweru, that country's disaster preparedness minister. Several hundred people have also fled to Tanzania, officials there said. Vice President Moody Awori said over a local television station the violence was costing the country US$31 million a day. Many businesses have closed down during the unrest and some foreign governments have advised their citizens against travel to the usually tourist-friendly nation. Opposition leader Raila Odinga has said he would go ahead with plans to lead a protest march in the capital Thursday even though the government has banned it. The Kenya Human Rights Commission and the International Federation for Human Rights called for calm Thursday. "If that takes place, there will certainly be bloodshed. A clash is certain to occur," Arms told CBS' The Early Show. 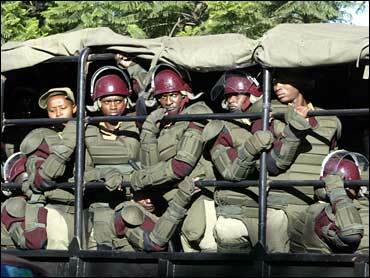 Government spokesman Mutua said the security forces had arrested 500 people since skirmishes began. Though much of Nairobi was quiet Wednesday, mothers clutching wide-eyed infants and suitcases were evacuated by riot police from the slum of Mathare while angry young people armed with machetes and axes heaped abuse on the police as the area burned. "All you do here is come to pick up bodies," shouted Boniface Shikami. Several threw rocks toward the police vehicle, and officers fired in the air before a patrol truck skidded around a corner to try to separate battling supporters of Odinga and Kibaki. As shopkeepers battled with flames leaping through their corrugated iron roofs, a dazed woman clutching a kitten wandered through the smoke. "They have burned down my house and all I have now is my cat," wailed Hannah Warigui. One man, Livingstone Wesonga, said his wife lost their fifth child on Tuesday night after complications during the delivery. Vigilante groups roaming the streets kept the family penned in their home and no ambulance or doctor was willing or able to come. Arms reports people across the country are living in fear that ethnic divisions suppressed in recent years could again erupt in war. "The veneer of this country is so thin. There has been this hatred all along," she said. Many people who live in the slums spent Tuesday night sleeping outside, for fear their homes may be set on fire as they slept, reports Arms. Dr. John Okello said clinics around the city were running short of basic materials because so many people have been arriving with machete wounds. While Kibaki and Odinga have support from across the tribal spectrum, the young people responsible for the violence tend to see politics in strictly ethnic terms. Kenya has more than 40 tribes, and political leaders have often used unemployed and uneducated young men to intimidate opponents. Kibaki's Kikuyu, Kenya's largest ethnic group, are accused of using their dominance of politics and business to the detriment of others. Odinga is from the Luo tribe, a smaller but still major tribe that says it has been marginalized. Kibaki, 76, won by a landslide in 2002, ending 24 years of rule by Daniel arap Moi. Kibaki is praised for turning the country into an east African economic powerhouse with an average growth rate of 5 percent, but his anti-graft campaign has been seen as a failure, and the country still struggles with tribalism and poverty. Odinga, 62, cast himself as a champion of the poor. His main constituency is the Kibera slum, where some 700,000 people live in poverty, but he has been accused of failing to do enough to help them in 15 years as a member of parliament. Kibaki was inaugurated for a second term Sunday, soon after election results were announced. The head of the country's electoral commission, Samuel Kivuitu, said he had been pressured by both sides to announce the results quickly - and perhaps wrongly. In Wednesday's edition, the country's oldest newspaper, The Standard, quoted Kivuitu as saying, "I do not know whether Kibaki won the election." In a joint statement, U.S. Secretary of State Condoleezza Rice and Britain's Foreign Secretary David Miliband said there were "independent reports of serious irregularities in the counting process." Odinga rejected a call by Kibaki for a meeting Tuesday, saying he would meet Kibaki only "if he announces that he was not elected" and telling The Associated Press in an interview that Kibaki's administration "is guilty, directly, of genocide."